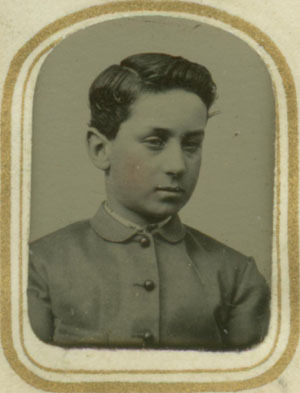 Henry Hersey Hinckley was born on 11 January 1853 in Boston, Suffolk County, Massachusetts, son of Henry Hersey Hinckley senior (1825-1860) and Sarah J. Taylor (c.1828-). 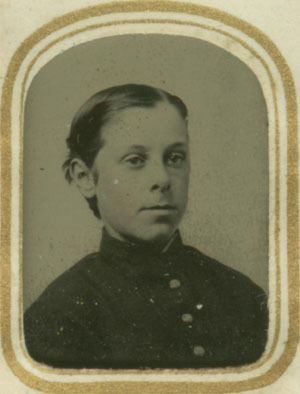 By the census of June 1860, the family were living at Roxbury, Suffolk County, where Henry senior was working in the clothing industry. 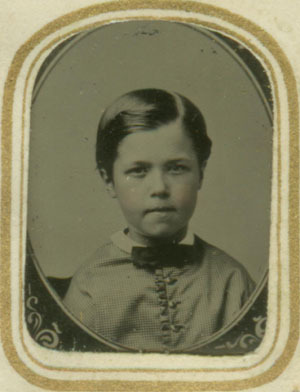 However, Henry died later that year, and Sarah moved back to Boston, where they were living by June 1870. 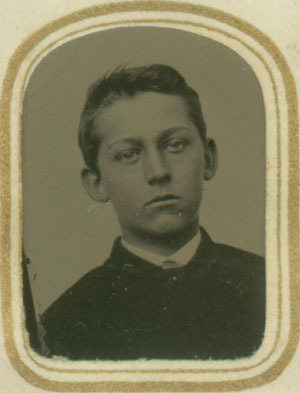 As his name is written on the inside cover of the album, Henry junior was almost certainly its owner. 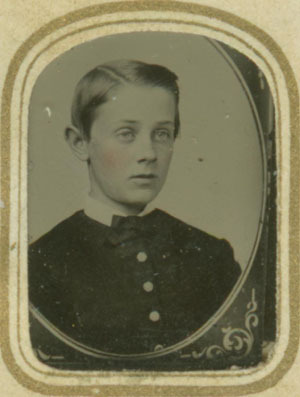 Many of the photos would have been taken after the death of Henry senior, so it is unlikely to have belonged to him. 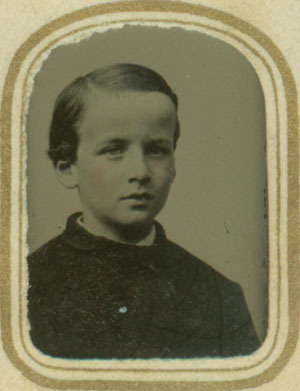 These two photos, annotated in the album, show him probably at ages of about eight (left) and eleven (right), and were therefore taken c. 1861 and c. 1864 respectively. 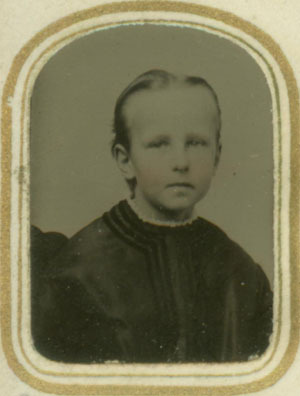 Henry's younger sister Esther May Hinckley was born at Boston on 1 February 1856, and was therefore three years younger than him. 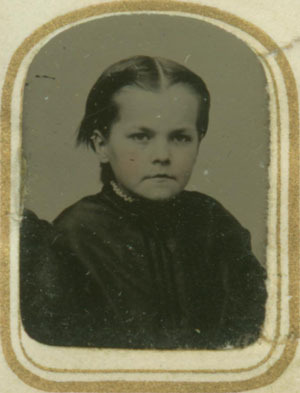 I estimate that these three photos were taken when she was about seven (below left), eight (below centre) and nine (below right), respectively, suggesting dates of between c. 1863 and 1866. 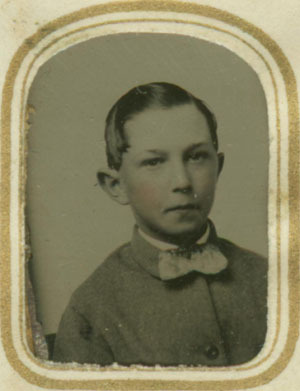 Henry and Esther's younger brother Daniel Taylor Hinckley was born at Boston on 8 May 1859. 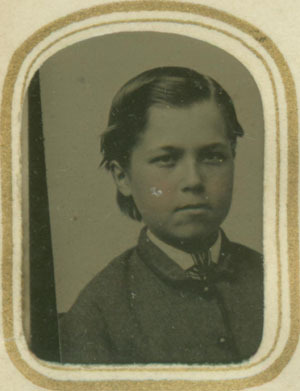 He appears to be aged about five (left) and seven (right) in these photos, which dates them at c. 1864 and c. 1866, respectively. 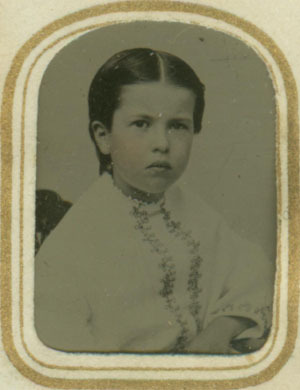 Sarah "Sallie" C. Barstow née Baker (1850-1879) was a cousin of Henry Hinckley's - her mother Esther May Baker née Hinckley was a sister of Henry's father Henry H. Hinckley senior (1825-1860). 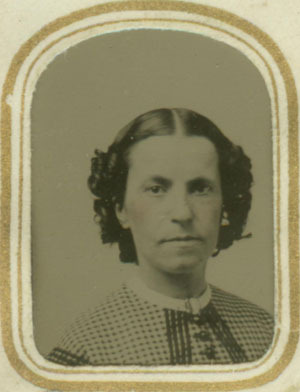 She married a stockbroker Rogers Lewis Barstow (1845-) at Boston, Suffolk, Mass. 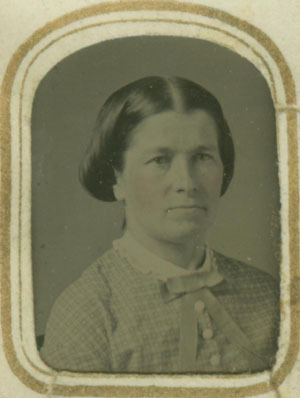 on 29 October 1872, and the fact that she is displaying her ring prominently in the photo at right suggests it was taken shortly after her wedding. 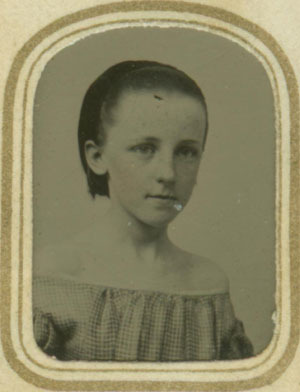 The earlier photograph of Sarah (at left) was possibly taken between 1866 and 1868. 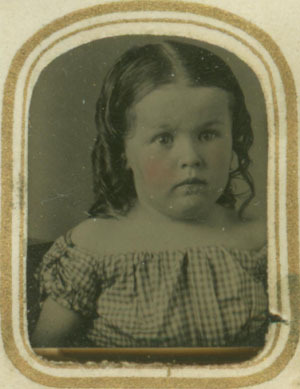 Sarah moved with her husband to Mattapoisett in Plymouth County where they had three children, but she died in 1879, three years after the birth of her second son. 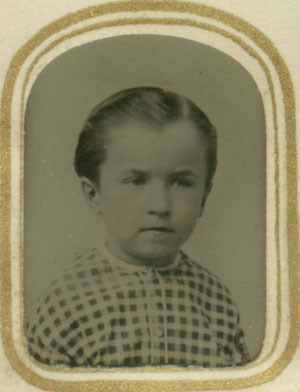 Carolyn "Carrie" Este Hinckley (1852-) (left) was a cousin of Henry H. Hinckley. 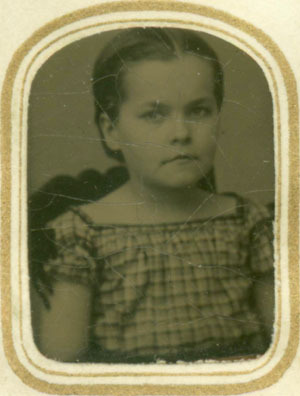 She was the second daughter of Abigail "Abby" Hinckley (sister to Henry H. Hinckley Senior) and her husband Josiah Hinckley. 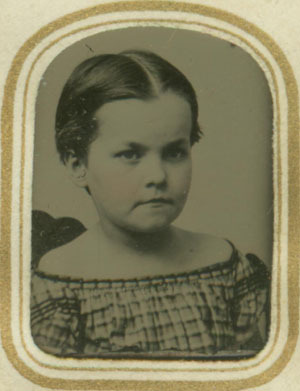 If this photograph was taken when she was aged 9-12, it dates to approximately 1861-64. 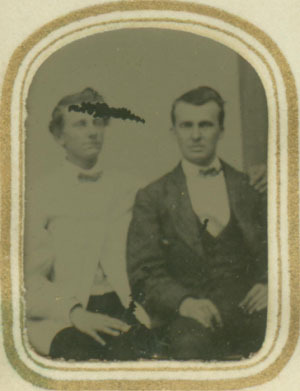 Charles "Charlie" Merrill Baker (1857-1918) (right) was the eldest son of Sallie Baker's oldest brother Ezra Howes Baker (1833-1888), and therefore Sallie's nephew. 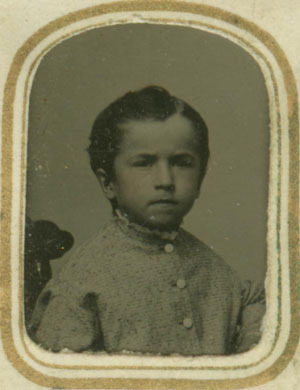 This photograph was possibly taken around 1872-1874, when he was aged about 6. 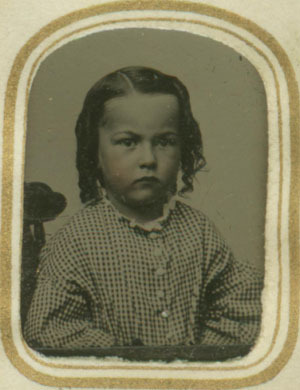 Henry's mother, Sarah J. Taylor, was one of five daughters of Daniel Taylor and Hannah Dunlap. 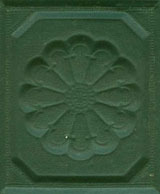 Only one of her sisters married (Elizabeth, to Charles E.C. 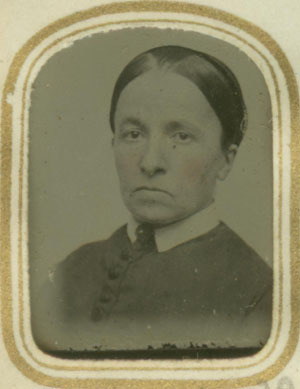 Hadley at Cambridge in 1859); the other three, Hannah Taylor (above left), Mary Taylor (above centre) and Fannie Taylor (above right) lived variously with their parents, their brother James, and their sisters Elizabeth Hadley and Sarah Hinckley. 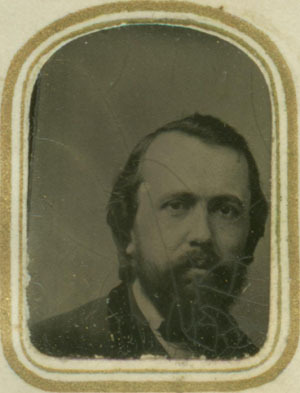 Sarah's only brotherJames L. Taylor (above left) was a wood engraver, and lived with his wife, also called Sarah, and their five children in Medford, Middlesex County. 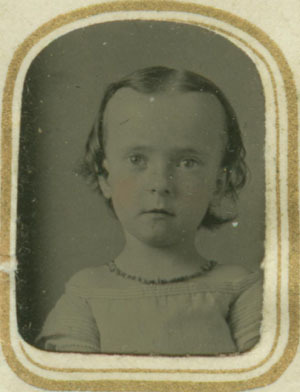 The children included Sallie Taylor (above centre and right), Jimmie Taylor (below, left and centre) and Fannie Taylor (below right). 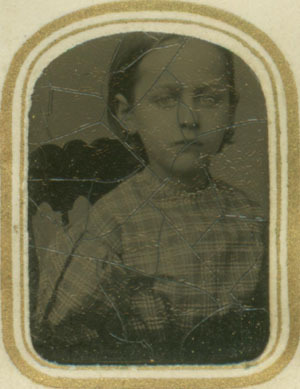 Emma D. Hadley was born at Medford, Middlesex County in 1857, eldest daughter of a bank note printer Charles Edward Hadley and Henry's aunt Elizabeth P. Taylor. 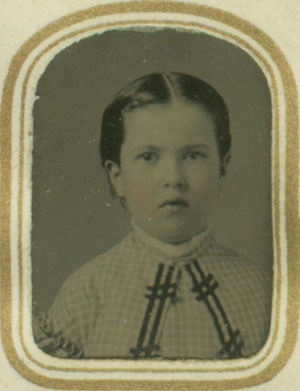 She had only one sister Elizabeth Hadley, born in 1863. 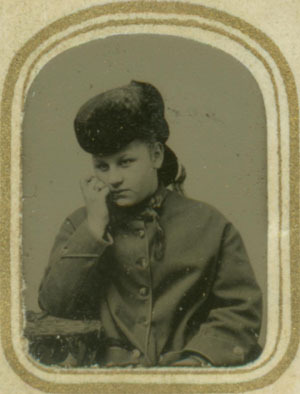 Emma later married Thomas C. Watkins (1848-) and had two sons and a daughter. 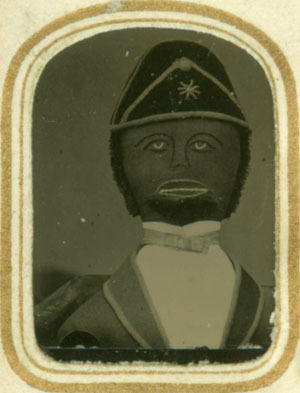 The fact that this photo is annotated "Emma Watkins" in the album suggests that the album was annotated, if not compiled, after her marriage c. 1881. 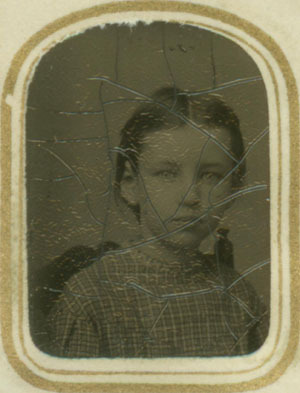 The photo at right is inscribed Lizzie Wright in the album, but it is not known how she was related to Henry. 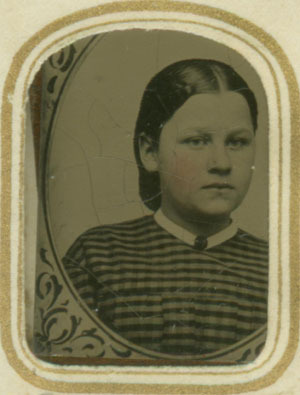 Clara (left) and Ada (right) Hersey were born in June 1856 and October 1859 at Boston, Suffolk County, the only children of Charles Henry Hersey (1831-) and Sarah Abigail Gray (1832-). 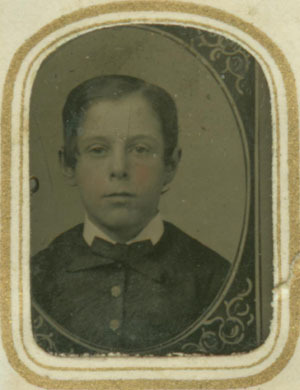 These two photos look to have been taken when they were aged around 9 and 6 respectively, giving dates of c.1864-1866. 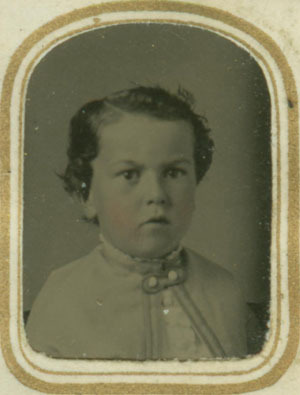 They were still spinsters at the time of the 1900 Federal Census, and perhaps never married. 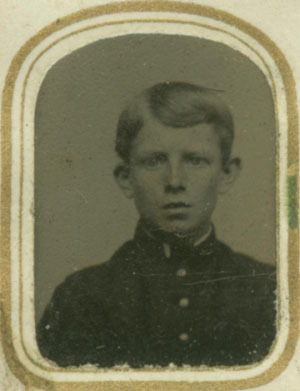 None of the eight photos of boys and men shown here are identified in the album. 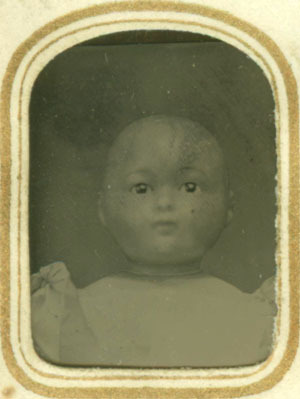 These two photos of dolls are merely annotated "Doll", and there are no clues as to their history or origin.